Architecture students Yip Siu, Robert Newcombe, Kerry Ngan and Shiyin Ling have had their designs celebrated at this year's London Affordable Housing Challenge. 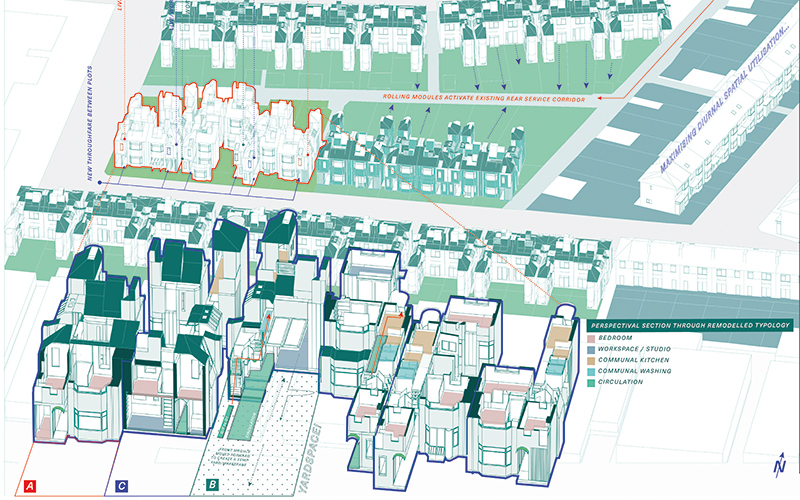 This term, Architecture MArch students from Unit 13 took part in the London Affordable Housing Challenge, using the Park Royal area of London as their testbed. Organised by Bee Breeders, the London Affordable Housing Challenge asked architects and designers to propose solutions for affordable housing in London. Students had four weeks to initiate an understanding of the site and design their housing proposals. Architecture MArch student Yip Siu won the student prize for his proposal, 'Wesley New Town / Chronotopia'. Yip investigated the process of developing a participatory approach to architecture, through an engaged involvement of local communities and actors. Three other proposals from Unit 13 students were commended by the judges, including one honourable mention for Robert Newcombe and two shortlisted proposals by Kerry Ngan and Shiyin Ling. “We are extremely proud that four submissions from Unit 13 students have been recongised in such a competitive professional competition.